Robins Theatre – Warren, Ohio. I’ll be speaking in at The Gallery at Alan Baxter Associates in London on February 24, 2018 for the Cinema Theatre Association. The address is 75 Cowcross Street, Farringdon, London EC1M 6EL. Doors will open at 5:00 PM and tickets cost £10.00 at the door (which includes wine and light refreshments). Copies of my first book, After the Final Curtain: The Fall of the American Movie Theater, will be available for purchase. It’s been a long time since I was last in England, and I can’t wait to check out some theaters while I’m there! On April 5, 2018 I’ll be speaking at the Cabot Theatre in Beverly, MA. I’ll also be exhibiting some new work at the gallery space in the theater. 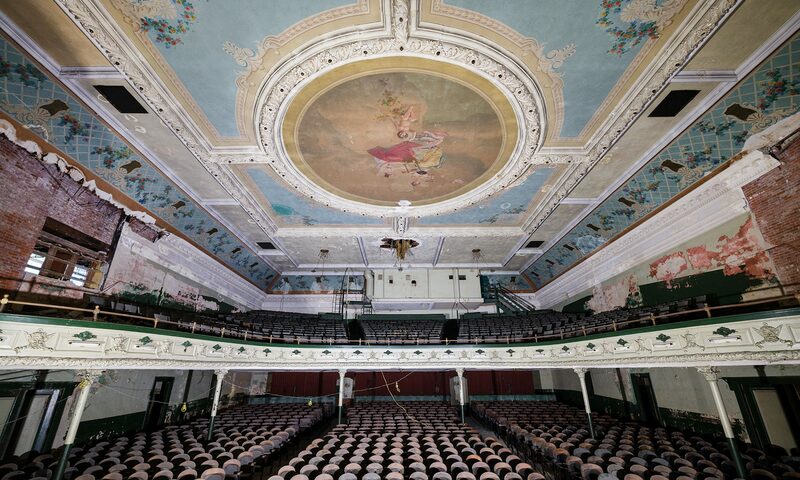 If you think the murals in this theater look familiar, it’s because they were most likely painted by the same artist as the ones in the Loew’s Poli and Loew’s Majestic Theatres in Bridgeport, CT. More details to come! I’ve secured another workshop date at the Everett Square Theatre in Boston, MA on April 14, 2018. I soft announced the first date on my Facebook page and it sold out in a few days. This one will probably go fast as well. You can find out more information and sign up here.